Tidy up your organisation’s local templates, searches, reports, concepts and protocols and delete/archive any items that are no longer in use. This will leave only those items which are actually in use for you to review/recreate once your organisation has been transitioned to SNOMED CT coding. Will allow you to search on a SNOMED CT Concept ID to view its mapped Read codes, enabling you to review and edit your existing, local templates, searches, reports, concepts and protocols. The Care Record Detailed View panel will display a Read code and its mapped SNOMED CT Concept ID. Phase 1c Rollout start date was 11.10.2018 (with EMIS Web 8.6) Will allow you to use EMIS Health authored SNOMED CT templates, searches, reports, concepts and protocols. The ability to create local templates, searches, reports, concepts and protocols in SNOMED CT (EMIS Health have said that they continue to explore the possibility of users converting their existing templates, searches, reports, concepts and protocols from Read to SNOMED CT and that they will provide further information on this in due course via their Support Centre). An enhanced code picker which allows the user to search on SNOMED CT Concept IDs [within the GP subset plus selected codes (including EMIS national codes) required to meet the national specifications for QOF and other extracts]. Additional functionality to group clinically equivalent synonymous terms and the promotion of the preferred clinical term. Access the NHS Digital monthly ‘Snap Update’ newsletter from the Delen website Resource Library. See NHS Digital's updated 'Dual Coding Fact Sheet' from the link on the Delen website 'Main Publications' page. NHS Digital has provided August 2018 webinar dates here, with further dates due to be published soon. Recorded webinars and slide presentations are also available. The latest ‘Snap Update’ (February 2018) from the NHS Digital SNOMED CT Implementation in Primary Care project team is now available. Wider rollout will follow the pilot phase once any changes have been undertaken, with expected implementation to be completed by autumn 2018. Principal GP clinical system suppliers will inform GP practices of their deployment plans. A new 'SNOMED CT – GP Practices Are You Prepared?' document is now available, from NHS Digital, for GP Practices to support their preparation for the transition to SNOMED CT. The latest 'Snap Update' (January 2018) from the NHS Digital SNOMED CT Implementation in Primary Care project team is now available. NHS Digital has announced some new March 2018 webinar dates – and have advised that GP practices may be particularly interested in “Exploring SNOMED CT content for General Practice” where you will learn more about the key hierarchies of findings/disorders, procedures, observables, and situations. In order to minimise disruption at year-end, SNOMED CT will be deployed in phases across general practice from April 2018. 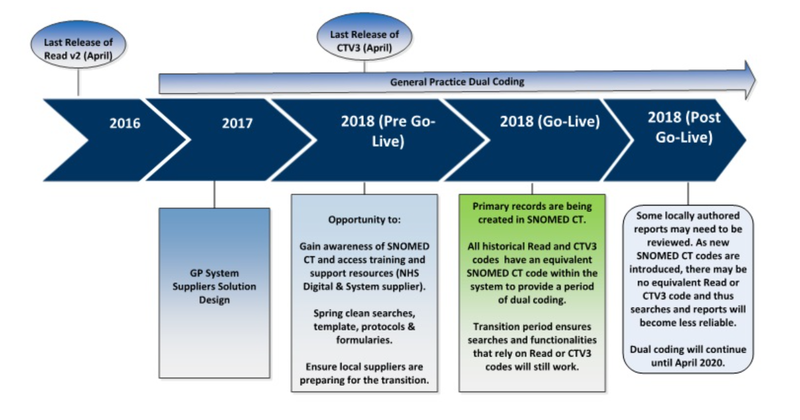 The introduction of SNOMED CT, which replaces Read/CTV 3 Codes, is being co-ordinated in primary care by NHS Digital, working closely with clinical system suppliers to support a smooth transition. The first phase of deployment will start with approximately 20 pilot sites, including all of the principal clinical supplier systems, after year-end business activities are completed. GP Clinical system suppliers will inform GP practices of their deployment plans. For further information on progress, visit the NHS Digital website. SNOMED CT will be deployed in phases across general practice from April 2018. Wider rollout will follow the pilot phase once any changes have been undertaken, with expected implementation to be completed by autumn 2018. Principal GP clinical system suppliers will inform GP practices of their deployment plans. You will need to be logged into the EMIS Health Support Centre to access the following links. for links to dedicated pages for latest news, deployment information, education and training resources, FAQs, etc. We recommend practices watch some of the NHS Digital webinars on the Delen website in order to familiarise themselves with the upcoming SNOMED-CT changes. If you have any questions regarding the above, please email the IT & Systems team via GP IT or call 020 3688 1881.